It is summertime which means teachers everywhere are putting their feet up and enjoying time away from the classroom! Let's be honest, though. Is school really the farthest thing from a teacher's mind right now? Definitely not. When teaching is your passion, it is nearly impossible to "turn it off" regardless of what time of year it is. We educators are constantly in a state of mental planning. For us, teaching isn't just a profession that is put on hold until the new school year begins. However, this time away is necessary. We need to take time to recuperate and enjoy ourselves. It is important to find a balance so that our summertime is relaxing yet still beneficial and productive. 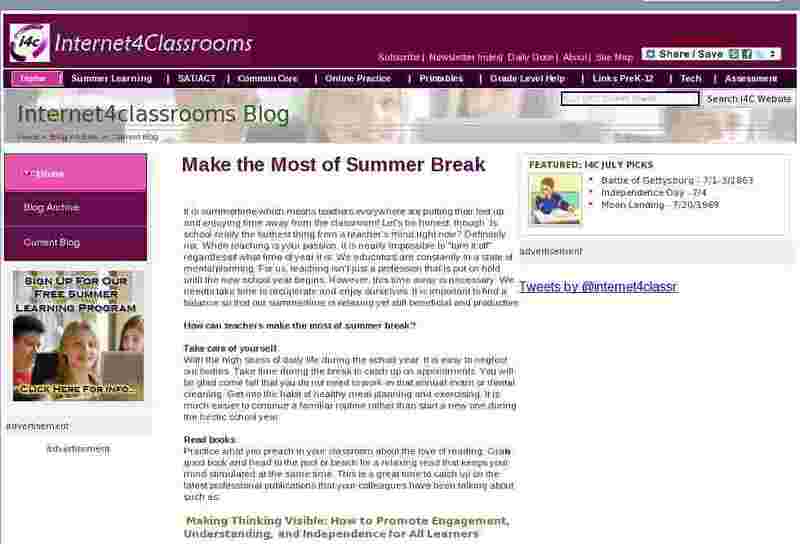 How can teachers make the most of summer break? With the high stress of daily life during the school year, it is easy to neglect our bodies. Take time during the break to catch up on appointments. You will be glad come fall that you do not need to work-in that annual exam or dental cleaning. Get into the habit of healthy meal planning and exercising. It is much easier to continue a familiar routine rather than start a new one during the hectic school year. I will be the first to admit that I feel guilty during the school year (especially the beginning!) when I spend hours outside of the regular school day planning, prepping, labeling, grading, etc. Once summertime hits, the only thing I want to do is make up for all that lost time. Thankfully I have these weeks to play dress-up, take mini trips, enjoy the backyard, and appreciate the special moments I get to share with my family. Make a summer to do list. I have a personal and a professional list. My personal list includes things such as organize the photo albums and various family-friendly day trips I want to take during the summer. My professional list consists of things such as creating center activities and revamping old charts. It is important to prioritize these lists so that you know what you really want to get accomplished during your time off. Of course, just like with anything else, you have to be reasonable. Planning lessons for the entire school year is a huge undertaking. Instead, start with setting the goal of planning the first month or first unit. That way, you will have a head start and you can always continue on if time allows. Pinterest is a wonderful tool for teachers, yet a dangerous (and addictive!) one! I made the mistake last summer of pinning 30+ projects for my classroom that I just had to have completed before day 1 of school. Needless to say making time for all of those would not have allowed for much of a balance during my weeks off. I am still an avid pinner but am a bit more realistic with my goal setting these days. Block off specific days or times for school planning. You definitely do not want the teacher in you to consume your entire summer vacation. On the flip side, you do not want to completely avoid all things school until panic sets in on the first day of in-service either. It is possible to have a healthy balance of both if you plan accordingly. I suggest setting aside a day each week or an hour a few times a week for your beginning of the year prep. This time could include looking for ideas, collaborating with other teachers, and/or making things for your classroom. That way, you should be able to accomplish things on your professional to do list gradually throughout the summer without wreaking havoc on your personal R & R time. Keep an eye out for classroom items. We are all aware of the fact that many of our classroom items were paid for out of our own pockets. Rather than devoting entire shopping trips specifically to classroom needs, I've made it a habit to constantly be on the lookout for bargains during my regular shopping trips. I suggest perusing the dollar sections and clearance aisles at your favorite stores. You never know when you might find something that would work perfectly in your classroom. Purchase those items that you know you will need for the following school year when they go on sale, especially seasonal items. Summertime is perfect for this because you are not as rushed or exhausted. My creative juices definitely tend to be flowing more in the summer when I am not as stressed! Don't yours? I hope that these tips will help you to make your time off fun and gratifying. Enjoy your summer! Mary Lirette is an Early Childhood Educator in Memphis, Tennessee. Visit her for creative teaching ideas and products to incorporate into your classroom.